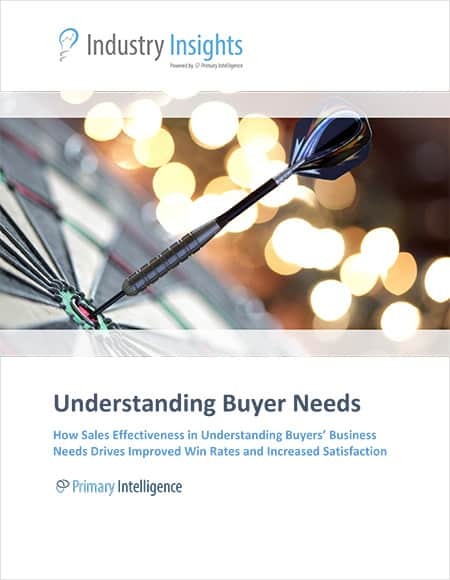 Understanding buyers’ needs is the most important sales benchmark driving purchase decisions in the B2B market, beating eight other standard categories Primary Intelligence uses to gauge sales effectiveness in sales evaluations. Not only is understanding buyer needs important in terms of winning competitive deals, it’s also important because of the spillover effect that understanding buyer needs creates in other areas of sales opportunities, areas that are seemingly unrelated and outside the control of the sales team. Despite the importance of understanding buyer needs, most sales reps perform poorly. Only 43 percent—less than half of the over 10,000 buyers Primary Intelligence interviewed—rated their sales team as “excellent” in understanding their business needs. In compelling industry research that analyzes buyer feedback from over 10,000 interviews with B2B decision makers, Primary Intelligence evaluates sellers’ ability to understand buyer needs, including segment break-outs by industry, geography, decision date, and deal size. What do buyers want from their sales representatives? How important is a sales rep’s ability to understand buyers’ business needs? In addition to understanding needs, what other factors impact a deal? How does a rep’s understanding of buyer needs influence a buyers’ perceptions of the product and their loyalty to the company?